Out of all the gym juices, boosters and supplements, the one almost universally recommended is creatine. Not only is creatine the go to for many pro athletes, but it also has a myriad of scientific studies to support it. However, there are so many options on the market, so how can you find the best option for you? Creatine is naturally found in the body, with 95% of it stored in your muscles. Therefore, it generally enters your body through animal products such as lean meats and fish. But there is a key step to identifying REAL vegan creatine, because some apparently plant-based options actually contain animal products (!). So, what creatine supplement should you take to maximise your performance? There are many options which all will boost your muscle strength available on the market. Take some time to workout which plant-based creatine is best for you. Below, you will find the five best vegan creatine supplements. How Do You Check Your Creatine Is Vegan? How Much Vegan Creatine Should You Consume? Is creatine legal? Is creatine vegan? Is it safe? Let’s delve into this mysterious compound. If you are on the mission to optimize your gym performance, you might want to consider adding it to your routine. While this compound is typically produced within the body, technology has allowed scientists to create a vegan version in the laboratory. Below you will find vegan creatine reviews so you can find the best creatine supplement to match your lifestyle. This creatine monohydrate powder by Bulk Supplements is created from 99.99% pure micronized creatine monohydrate. It is lab tested for verification and purity to ensure the users can feel the full benefits of high intensity energy, increased strength and power. The product is also non-GMO and unflavoured. Its micronized state also means it easy to dissolve on liquids making it the perfect, great value for the money option. This powder is the best vegan creatine value for your money. The simple packaging, non-added flavors or scoops makes this a no fuss option. Another benefit is that it is micronized creatine. This means it will take you no time at all for it to dissolve in water or smoothies. The fact it has no additional flavors means it has a neutral taste that can be easily mixed into smoothies. Due to the cheap cost of this product, the bag does not reseal too easily. You would want to place the creatine into a different container for better storage. If you are sensitive to headaches, you may also experience some discomfort from this creatine powder. Now Foods has proudly created a vegan creatine monohydrate that is free of preservatives and additives. The Now Sports Creatine product is 100% natural, free of flavour and allows anyone to have access to premium creatine monohydrate even on a tight budget. They have a vegan symbol on the packaging, eliminating any uncertainty about the source of the creatine. If you are looking for a creatine supplement whose parent company has a commitment to natural ingredients, then NOW is your best option. NOW is also budget friendly, giving you a lot of servings for a low price to immediately boost your working out results. They are also a proud partner with Terra Cycle. This allows them to close the loop on hard to recycle products such as toothpaste pouches tubes and food pouches. Overall showing their commitment to the environment. Recently the manufacturer has changed to China. This has caused some doubt about the standard of the product. If you prefer a US based product, potentially opt for another creatine powder. This shift in manufactures has found customers experiencing some digestive discomfort. 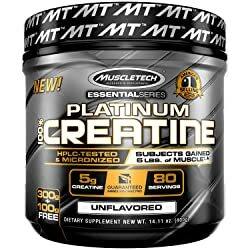 MuscleTech’s Platinum Creatine is HPLC-tested micronized creatine monohydrate without fillers, added sugars of flavours. Each serving produces 5 grams of premium quality product, which has been studied most in sports nutrition. The company is strongly focused on providing their customers with high quality scientifically backed creatine to enhance muscle ability to regenerate adenosine triphosphate (ATP). 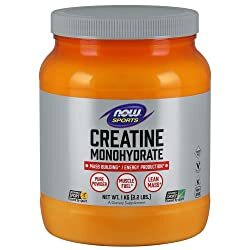 Their commitment to using 100% pure creatine monohydrate is backed by experts claiming that this form of creatine is the best currently available on the market. If you are interested in creatine that has been the subject of many scientific studies, then MuscleTech might be the best bet. MuscleTech has scientifically tested all their products to provide the best products to their customers. The studies found that heavy lifting trainers built 6 pounds of lean muscle in just six weeks. Other studies investigating strength found test subjects improved their bench press by 18.6% in just 10 days. The product itself also contains 100% pure creatine monohydrate, which is one creatine molecule with one water molecule), making it easy to dissolve and digest. These clinical trials found that MuscleTech’s creatine is ideal for before and after your workout. If you have a sensitive stomach, you may experience some digestive discomfort when using this creatine. The creatine also comes in a giant tub which takes up a lot of space in your home, and only comes half full. 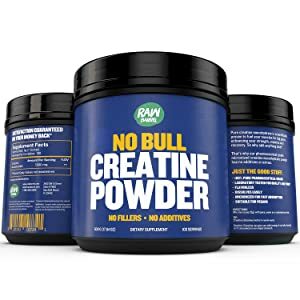 The No Bull creatine powder is micronized for fast absorption, as the small particles allow muscles to gain the needed energy boost efficiently. It is 100% pharmaceutical grade, lab tested and free from fillers or flavourings. If you are unsure about committing to a creatine supplement NO BULL creatine might have the best solution for you. The supplement comes in a 100-day tub and includes a lifetime warranty. If you are not satisfied, you can ship it back and get a full refund. The content of the No Bull tub is a smooth, micronized supplement which makes it easy for you to mix into a juice, water or smoothie. If you are relatively new to training, you would also benefit from their Free Digital Guide available with every purchase of the creatine tub. Sometimes the powder dissolves better when using hot water, which is a little extra hassle in your morning routine. The creatine powder comes in a large tub, which is only filled half way. This has caused some people to complain about the unnecessary packaging waste. Jarrow Formulas is manufactured in Germany and prides itself with a creatine monohydrate to enhance muscular performance for all its customers. It is flavourless making it perfect for mixing it into your water, juice or smoothies. The tub itself has a wide-mouth so it is easy to scoop out the required daily dose. This product comes with a scoop included eliminating any additional fuss about using the exact serving size. 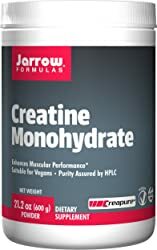 If you are concerned about consuming genetically modified products, Jarrow Formulas creatine might be the best option for you. It is also easily mixed with water and other liquids, making it ideal for a quick morning boost. This product can potentially cause some stomach upset, so if you are sensitive, consider trying an alternative. It comes in a big container, so if you do not like this product you are stuck with a large amount of it. Jarrow Formulas also offers a capsule form. HOWEVER, the capsule form probably isn't vegan (contains gelatin) and the capsules package doesn't specify "suitable for vegans" like the powder does. So stick with the powder. So now that you know about the options for your creatine intake, let’s have a quick look at what these products do for your body. Creatine is a substance that is created in muscle cells and helps produce energy during lifting, or high intensity training. On the chemical level, creatine shares many similarities with amino acids. Our own bodies can create it, however the amounts in your body depend on meat intake, exercise, muscle mass and hormone levels. And if you’re not consuming any animal products as a vegetarian or vegan, to get more creatine in your body means you will need to supplement to boost your levels. If you add some creatine supplement into your daily routine, you increase the stores of phosphocreatine. This is a stored version of creatine in your cells and helps produce high energy molecules called Adenosine Triphosphate (ATP). ATP is the body’s energy system, the more of this molecule you have, the better your body can perform during exercise. Simply, additional creatine creates additional stores of phosphocreatine in your muscles, these can then be used to produce more ATP. Better Workload: Which allows you to increase your total work in a single training session. Increased Cell Hydration: Additional creatine increases water content inside your muscle cells. This allows an increase in muscle growth. Less Protein Breakdown: Your total muscle mass can increase by reducing the amount of muscle breakdown. Anaerobic Endurance: Creatine creates an energy buffer for your muscles in the form of phosphocreatine. Increased Strength: One scientific review found that creatine supplementation increased the subjects strength by 8%. Essentially, creatine gives your muscles more energy and allows for changes inside your cells to increase muscle growth. As a vegan, should you be taking creatine? Is there plant-based creatine? Will it help improve your workouts? Does it impact vegans the same way as omnivores? Omnivores can depend on getting their dose of creatine from consuming animal products such as muscle, veins, and tendons. However, for them to reach the daily recommended amount of creatine they need to consume a large amount of carcinogenic meat -Which could potentially cancel out the benefits of this substance in the first place. The creatine from meat is also absorbed much less efficiently than if from supplements. Unfortunately, the default of most foods and supplements available on the market is that they are not vegan. Typically, you will find that especially in terms of creatine you will be much better off picking the powdered, non-flavoured basic options. Creatine itself in its pure form is vegan, however additives can potentially be from animals. Capsules can throw off a consumer. While some individuals prefer to consume their creatine through capsule form, the material required to create this is generally animal based. Most capsules are made from gelatin, which is a colourless and tasteless water-soluble protein. While an ideal substance to create capsules, unfortunately it is made from collagen which is the main structural protein found in skin and connective tissues in animals. This means, even if the brand produces 100% plant-based creatine, the packaging could make the supplement non-vegan. So look for the label to specify something along the lines of “vegetable sourced”, “vegetable cellulose,” or similar next to the capsule/gelatin ingredients listing to indicate the capsule is not an animal product. A good rule of thumb to follow is that any brand that produces a vegan product will proudly display this on their packaging. If you are unsure, contact the company to verify. The standard dosage is 5 grams per day. Some studies found that even 0.03 grams per kilo of lean body mass found participants see an increase in their muscle creatine. When you start your vegan creatine supplement journey, you might want to consider beginning with a loading phase. This creates a rapid increase in your muscle’s stores of creatine. For this phase, you should take 20 grams per day for 5-7 days. This can be split into four 5-gram servings throughout the day. After this initial period, you can take 3-5 grams per day to maintain the high level of creatine within your muscles. If you chose to skip the loading phase, it might take 3-4 weeks to maximise your creatine stores. The daily healthy dose is 5 grams per day and it is advisable to take creatine with a glass of water to ensure you stay hydrated. There are many vegan creatine supplements on the market, with each possessing it’s own positives and negatives. Luckily, there are many reviews you can check out to find the one which fits your lifestyle the best. And to conclude this review, our #1 choice is Bulk Supplements’ Creatine Monohydrate Powder. The high purity, micronized product comes at a low price point and you just can’t go wrong with it. Consuming creatine helps boost your fitness and work out regime. It maximises the strength and energy stores within your muscles. There are many clinical studies that have shown that creatine is safe and has physical and cognitive benefits. While creatine is typically found in animal products such as steak, the best vegan creatine supplements reviewed above provide a great plant-based alternative. So, get healthy, get strong and use vegan creatine to reach your ultimate workout goals.